2010 NFL Picks 49ers vs Atlanta Falcons NFL Predictions Expert Breakdown - Finally, the Vegas odds have caught-up with the 49ers play. A week after being picked as a road favorite at Kansas City and getting beat 31-10, the Vegas odds have the San Francisco 49ers as +6 ½ at the Atlanta Falcons in this week 4 NFL Picks matchup. Vegas got it right this time. At 0-3, the 49ers are the most disappointing team of the young season. Predicted by many to win the NFC West, the 49ers cannot buy a win. Both the defense and offense have taken turns letting the team down and, after nearly upsetting the Saints at home on MNF. Kansas City piled-up yards on the ground and via passing while accumulating 457 yards. The 49ers were pushed around on the line of scrimmage, not getting any pressure on the passer, and the secondary let Matt Cassel do whatever he wanted. Linebacker Patrick Willis is still the leading tackler but the entire defense needs to get more pressure on the quarterback and make more plays. Atlanta (2-1), meanwhile, made enough plays to upset the world champion Saints 27-24, presenting the type of balanced attack that gave the 49ers fits last week. Michael Turner returned from injury to gain 114 tough yards on 30 carries and is the type of back that will give the San Francisco defense fits. 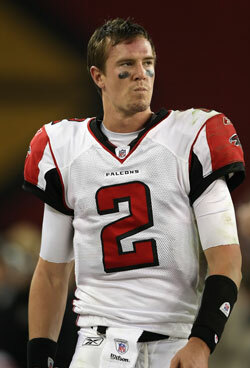 Matt Ryan has been finding Roddy White and tight end Tony Gonzalez to great effect. Gonzalez made a huge impression in the New Orleans and, as always is a dangerous weapon in the red zone. There is a lot to like about Atlanta this week – a west coast team visiting the east coast, a weak 49ers offense, momentum from two strong NFL Predictions wins – but the Vegas Lines might be a little high in this NFL Picks matchup. The best way to bet this game is to bet on San Francisco 49ers vs Atlanta Falcons OVER the posted total. Over is 4-1 in 49ers last 5 NFL Picks games after scoring less than 15 points in their previous game. Bodog Sportsbook has the best Las Vegas Odds on the total in this NFL Predictions game sitting at 42 points. Open up account with Bodog.com today and receive a 10% Sign up Bonus.